Tahiti Thatch - Quantity of 1 panel. FREE SHIPPING!!! 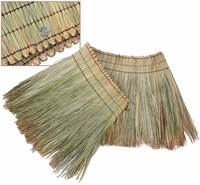 Fiji thatch panels can be fire retarded for indoor or outdoor applications and passes a class A, ASTM E-84 rating. Tahiti Top Cones are available to finish off a circular structure. * Each Fiji thatch panel provides 2.5 sq ft roof coverage when installed 12 on center. * Thatch tiles can either be tied to 8mm (1/2") steel rods of an Tiki Shack Hut frame or nailed or stapled to wooden battens. * The thatch tiles are installed in layered courses every 12". FAQs About Tahiti thatch: I am installing an Tiki Shack Tahiti Thatch umbrella and I need to cut a panel width as it is too long, how do I go about that? Using a sharp edge, cut the panel and the cords at least 2" in addition from the desired finished width. Remove the palm fronds until you have the correct width. If you pull away the fronds and leave the cord there will be enough cord to tie a knot to seal the edges so that no additional fronds can come loose. Can I install the tiki bar roof thatch directly onto an existing roof? Absolutely, however we do recommend you attach to heavy duty wooden beams with horizontal then vertical strips This allows ventilation and drainage around the thatch which increases the longevity of the product if it is able to breathe. If appling to a plywood roof that will not last as long because of moisture not ventilating correctly. Can you suggest what I should use at the top of my umbrella? Tiki Shack supplies the Tahiti Top Cones which match the Tahiti Thatch Panels. This is a great way to finish off the structure giving the umbrella an island flare. Can the Tahiti Thatch Panels be fire retarded? Yes. In order to receive a Fire Retardant Certificate for your Fire Marshal, Tiki Shack can either pre-fire retarded the Tahiti Thatch Panels to a class A rating and then ship. If you choose to apply the fire retardant yourself, this can be purchased from Tiki Shack Importer but we would not be able to issue a certificate.